Hispanic and Latino students have long benefited from the opportunity to live and study abroad. Hispanic cultures have always had a major influence on shaping the United States, especially with increased immigration from Latin America in recent decades. Doing Hispanic studies abroad is an amazing opportunity to showcase the great diversity that makes up the United States. Here are 10 reasons why you should consider international studies abroad. There are so many amazing things to experience around the world. Expand your knowledge of the world by actually being there, seeing it, touching it and experiencing it. In 1949, James Baldwin, the renowned African-American writer, wrote in Notes of a Native Son, “From the vantage point of Europe, [the American student] discovers his own country.” Learning about your own country by living abroad remains extremely relevant today as we continue to further our understanding of other cultures. Getting in touch with your family’s heritage can be another strong motivation to study abroad. Many minority students report tremendous educational and personal benefits from exploring countries where their families have roots. International experience is a critical and impressive part of any résumé. Many Hispanic/Latino students who study abroad in Spanish-speaking countries find that they are able to build upon and improve their Spanish language skills. 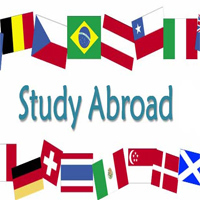 While studying abroad, you will have the opportunity to truly become a full-time student. Weekend excursions to museums and cultural sites add to your academic and personal growth. You learn to interact with people who may not necessarily think or communicate like you. Through international studies abroad, You will have the opportunity to meet people from different backgrounds and cultures, and some of these people may even become lifelong friends. Hispanic-American students may become frustrated when stereotypes from home follow them overseas. However, this is also a unique opportunity to educate others about who you are as an individual and as a group. In addition to serving as a cultural ambassador to dispel other’s misconceptions, international studies abroad give you a chance to break down some of your own stereotypes about other countries and peoples. If traveling to your family’s native country, you may be surprised to find that you don’t in fact know everything about your own culture! During your international studies abroad, you will be exposed to countless experiences that may influence the rest of your life. Some students even end up changing their major or career path as a result of the new things they learn from being abroad. Gary Rhodes, Ph.D., is director for Project for Learning Abroad, Training, and Outreach (PLATO) at the Center for Global Education at Loyola Marymount University. Learn more about Hispanic studies and other international studies abroad. Enroll in NextStep University today.